Porsche Club America, Diablo Region track event at Thunderhill Raceway in Willows, CA, September 5, 2013. 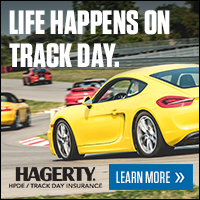 This event is the day before HOD's "Derric's Day For Prostate Cancer" at Thunderhill. THIS EVENT IS FOR PORSCHE CARS only – but it doesn't matter where the engine is! This event is open to drivers with no track experience ranging up to advanced level. We have three run groups allocated by experience of track driving and, of Thunderhill. Passing will be with mandatory point-by in all groups. Instructors will be allocated to all 'first time' drivers to the track. We limit the size of our events to 60 drivers maximum, including instructors who run in the advanced group. We are a Porsche club, not a driving school or a driving business, we several run safe, fun and friendly track events each year. We do not race, time trial or time laps. We limit our events so that we can offer plenty of room on track and lots of track time. The registration fee includes a full buffet lunch in the Clubhouse and bottled water throughout the day. All drivers must certify that their car has passed a safety inspection within 30 days of this event per PCA guidelines the safety inspection form can be downloaded at (https://www.diablo-pca.org/driver-education). All drivers will complete this safety inspection form which verifies the condition of their car is ready for the track and will be handed to us at check-in, or at 'grid tech', which is final inspection of your car on the day of the event. Well maintained Porsches should have no problem passing tech inspection, if they have good brakes, tires, no oil leaks and no defects. If in doubt, have the experts look at your car. A no-host group dinner and check-in, for those who travel up the night before, will be at Casa Ramos in Willows at 6.30pm on September 4, 2013. Further details will be provided to all registered participants close to the day. Registration Fee: $280, cancellation fee $75. No refunds after August 22, 2013. Instructors $50 - guest instructors or those not driving may come along for free. Lunch and bottled water is included with all registrations.